Our friend and former Angry Reader of the Week Kate Agathon has been working hard to organize an art exhibition, ImaginAsian (no relation to the multimedia company of the same name), in celebration of APA Heritage Month at Purdue University. Sponsored by the Asian American Network of Indiana, the exhibit is comprised of 66 pieces of work donated by 60 contributors, including writer Lac Su, artist and author Kip Fulbeck, civil rights activist Yuri Kochiyama, director Michael Kang, Senator Daniel Inouye, G.I. Joe creator Larry Hama, and other stakeholders in the Asian American community. The exhibit runs April 2 - May 9, 2010 at the Tippecanoe Arts Federation located at 638 North Street in Lafayette, Indiana. For more information, visit the ImaginAsian website here and the Facebook group here. Can't make it to Indiana? Right now, additional pieces of art are being auctioned online. All proceeds will go towards the purchase of Asian American Studies materials for the Purdue University Libraries. Take a look at all the cool stuff you can bid on here. 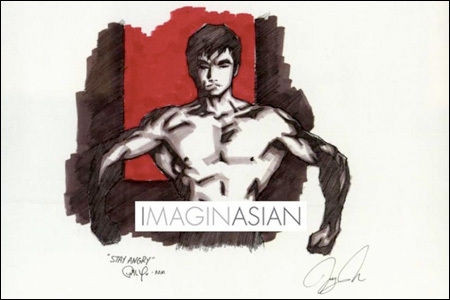 I collaborated with artist Jerry Ma to donate a cool Bruce Lee sketch (above) to the auction. I feel kind of silly about it. Jerry actually did most of the heavy lifting -- I just signed the damn thing. But I think piece is pretty sweet. However, as I write this, there are currently 0 bids. Aw man. How about showing us a little love, and supporting a great cause? Bid on it here.